Good evening from EPHQ everyone! I have a totally special Wedding Tip of the Week for you from my good friends and Partner of Esquire Photography; Shelly at Simply Bridal. 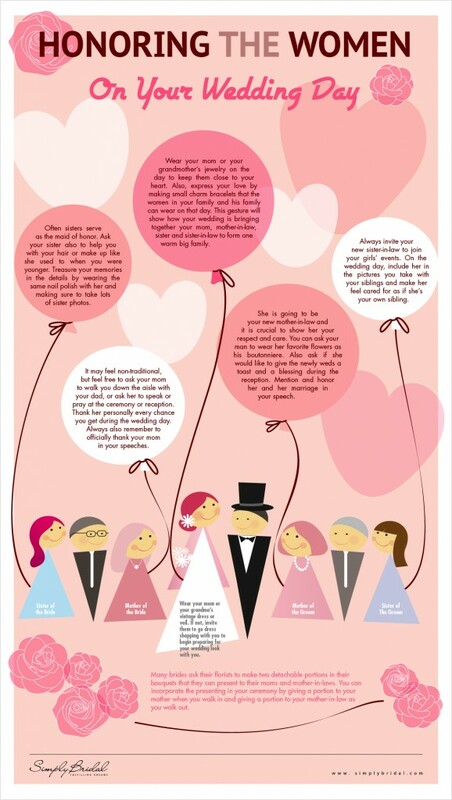 Creeping up this weekend is Mothers Day, and in honor of all the women in the world my friend: Shelly at Simply Bridal has created a special infographic to help all the women at your wedding feel special. Of course the bride is the golden start on her wedding day, but the special union is special to all the members of both families. As the bride, it is your responsibility to make sure everyone is included, make sure that the sister of the groom is treated just as dearly as your own (because you are one big family now)! Simply Bridal has brainstormed a few ideas for each female member of both families. I am so thrilled to be able to honor women in the world. Men honoring women is great, but women honoring women is magical! Thanks again to my friend; Shelly at Simply Bridal for the great wedding tip to honour our mothers! That was really awesome of her to do that! To help other couples plan a beautiful wedding with the right vendors!